In his third dispatch aboard the Africa Mercy hospital ship (currently in Douala, Cameroon), Dr. Sherif Emil writes about the ship's nursing staff. Pulled together from around the world, many have put their careers on hold while they volunteer their services. 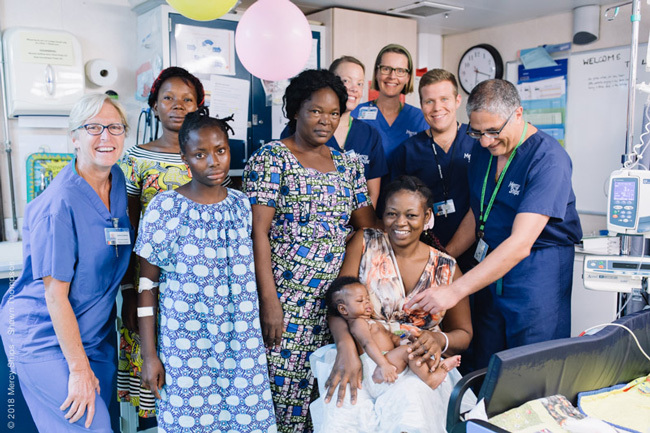 Dr. Sheriff Emil (extreme right) and Dr. Etienne St-Louis, McGill surgery resident (beside Dr. Emil), with patients, families and nurses on the ward. I am now half way into my mission. There are several very challenging patients on the ward, including a 3-month old baby boy recovering from the resection of a sacrococcygeal tumor that was about one third of his total weight. Attending to this one patient alone is a challenge at best. I am amazed by the level of care delivered. It reminds me that the best nursing is not delivered with resources, but with heart and passion. Every day I walk into the ward to see nurses who have travelled half way across the world to live in tight, shared cabins and serve those who most need them. They may not share their patient’s cultures or understand their languages, but they know that genuine compassion – the desire to care and comfort – can break down any barriers. And they break those barriers daily.